Can substitute any ground wild game meat, such as bison, deer and antelope. Sauce recipe yields 6 cups of enchilada sauce. Heat 1 tablespoon oil in a large skillet over medium heat. Add the onions sautéing until softened and translucent, usually about 5 minutes. Add the garlic and sauté for a few minutes. Stir in the chopped green chilies, chopped green tomatoes and chicken broth. Reduce heat and cover with a lid simmering until the tomatoes break down, usually about 10 minutes. Stir in cumin, oregano and salt. Remove from heat. Pour the mixture into a blender add the cilantro and blend until smooth. Preheat oven to 375 degrees F. Using the same skillet, heat 1 tablespoon of oil over medium heat. Add ground elk meat to skillet and cook until lightly browned. Stir in cumin, chili powder, oregano, onion powder and salt. Remove from heat when done. Add 1 cup of shredded cheese to elk meat and stir together. Using a glass baking dish or foil pan, coat the bottom with a little green tomato sauce. Fill flour tortillas with heaping spoons of cooked ground elk, roll and place seam side down in baking dish. Repeat until done. 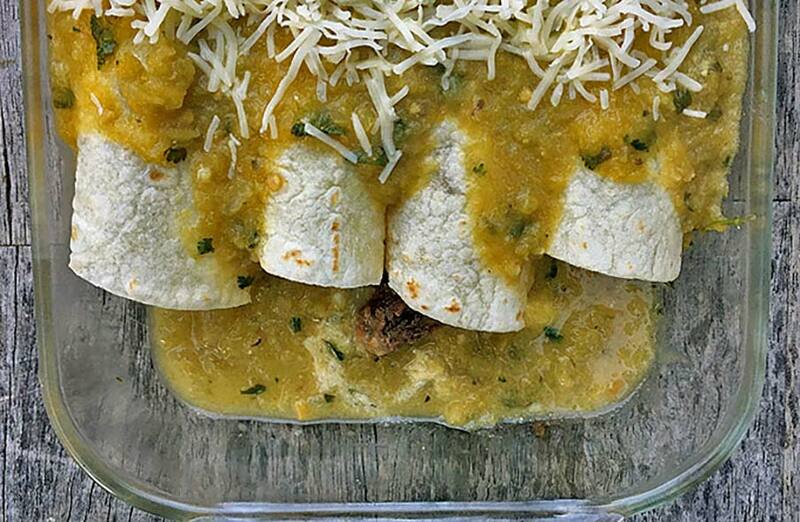 Pour the green tomato enchilada sauce over the top of the flour tortillas. Top with the remaining cheese. Cover with foil and bake for 30 minutes. Remove foil and continue to bake for 10 minutes. Remove when sauce is bubbly and cheese is melted.